Coming Saturday! Shower favor soaps for weddings, bridal showers or baby showers, with optional personalized tags. Pre-orders for chocolate peppermint cupcake soap starting soon! 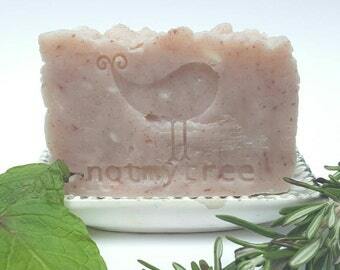 In the meantime, I have several other all-natural soaps in my shop and ready to go! Rosemary-Mint Lotion Sticks. This is how we roll on Friday afternoons. Last step in my road to listing my first spa basket: crochet face cloth. On the soap bench today: Rosemary Spearmint. Scented with essential oil and colored with rose kaolin clay. Because some days you need a day off from your shop to spend time with the people who inspired you to start your shop in the first place.